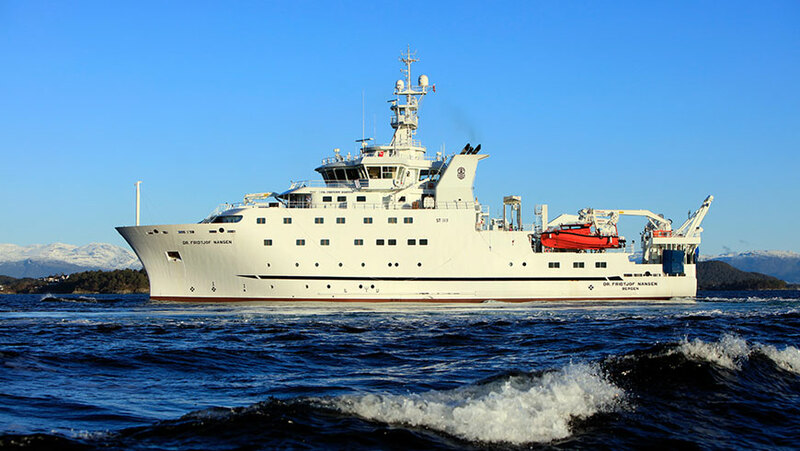 In 2017, the UN Food and Agriculture Organization (FAO) and Norway launched a new, state-of-the-art marine studies vessel, among the most advanced of its kind. Its mission: To investigate some of the planet's least-explored ocean using cutting-edge technology and sophisticated equipment to help developing countries assemble scientific data critical to sustainable fisheries management, and study how a changing climate is affecting our oceans. One of the world's most advanced marine research facilities, the Nansen, 3rd ship to bear that name during FAO and Norway’s ongoing 40-year partnership, houses seven different laboratories. Packed with high tech gadgetry, the ship includes a new-generation acoustic gear for biomass assessments and ocean floor mapping, a remote underwater vehicle control center, "manta trawls" that collect plankton and microscopic plastic particles, and a laboratory designed for climate studies. As the only research ship in the world flying the UN flag, the Dr. Fridtjof Nansen can sail freely across different jurisdictional boundaries, unfettered in its pursuit of natural resource challenges that transcend borders. This makes the Nansen very complementary to the transboundary nature of the Global Environment Facility (GEF)’s International Waters focal area, helping countries meet the challenges in managing shared transboundary marine ecosystems. Since the 1970s, Nansen research vessels have helped almost all African coastal countries to assess fish populations, survey and gather data on ocean temperature, salinity and oxygen content, and sample the seafloor to better understand its nature. Such data — expanded on over time through ongoing research — is essential for the development of fisheries policies that promote better, more sustainable use of marine resources: a major source of food and income for millions of the world's poorest people. Improved policies and strengthened capacities are almost always included by countries as high priorities in GEF-funded Strategic Action Programmes (SAP) for large marine ecosystems. Along the way, hundreds of scientists from Africa, Asia and South America have worked and trained aboard Nansen ships, acquiring new skills and knowledge that might have otherwise been out of reach. FAO and Norway’s partnership is a terrific example of the power of the GEF partnership. The Nansen’s work will continue to provide solid baseline information and capacity building support upon which the GEF builds incremental support, catalyzing blue economies, biodiversity conservation and improved management of transboundary resources. This year, the Dr. Fridtjof Nansen is scheduled to visit several large marine ecosystems where the GEF partnership has been or is currently active, including the: Benguela Current, Guinea Current, Canary Current, the Agulhas Current, and the Bay of Bengal. In 2018, the Nansen turns her attention to surveys along the Mozambique and Tanzanian coastlines, moving to the Seychelles and Mauritius and finally on to the Bay of Bengal countries of Sri Lanka, Bangladesh, Myanmar, and Thailand. In 2017, the 8 littoral countries around the Bay of Bengal came together to sign the GEF-supported SAP for the Bay of Bengal. The Nansen’s survey work in the region will help countries to address the priorities they identified. Stay tuned!